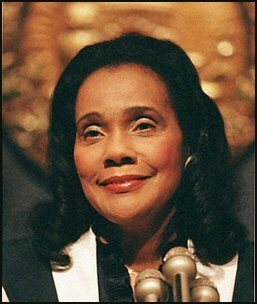 Coretta King’s most enduring contribution to American culture has been as chair of the Martin L. King Jr. Federal Holiday Commission. In the late 1970s the King Center collected six million signatures on a petition urging the creation of a Martin Luther King Jr. memorial holiday, and in November 1983 President Ronald Reagan signed the bill designating the national holiday. open a Holiday lobbying office and staff in Washington, D.C. Later that year Coretta Scott King and Stevie Wonder presented a petition to Speaker Tip O’Neill (D-Mass.) containing the signatures of six million citizens.